Flash Player - It lives and it's not going anywhere. UPDATE: I would like to point out that you all need to IGNORE the articles out there on the web right now boasting the headline "Flash to be discontinued by 2020". This is NOT the case!!! Adobe and Google had a silent dispute, away from public eye. It is hard to source because this is supposed to be "leaked information" and technically not supposed to be discussed. Any sources will be added when they become available. Adobe is now currently pushing for indefinite "maintenance" of flashplayer, where no more features will be added and that in house (baked in) versions for Edge are being considered. 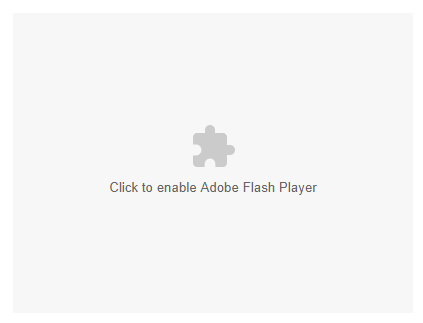 I would also like to point out that HTML5 is not meant to replace Flash. HTML5 is replacing HTML, it is the fundamental language in which all websites exist. HTML5 is the internet, while Flash is simply a luxury or optional add-on, it was never forced on users, however HTML5 is indeed forced on 100% of users. Whatever exploits or vulnerabilities are founded on HTML5, they cannot be patched, ever, especially core functions (which many cheat sheet exploits for HTML5 currently use). Attempting to change the core will break every website out there overnight. Without further ado, on with the article. I had a revelation yesterday, I got my yearly bill from web hosting at A Small Orange (shameful plug), which lead me to revisit my old Flash website! The URL is http://www.hugclub.net, a cute web store and e-card website. About 2 years ago, it stopped working. I would visit the page and nothing would load. All I got was "if nothing loads, download flashplayer". Obviously downloading flashplayer won't work. All Flash devs were hit with the news that Chrome, Fox etc would no longer support flashplayer. You had to manually enable it in settings and whitelist websites that you wanted it to work on. It had me in such an uproar because I didn't expect anyone to go through such trouble just to view my site. I actually put a banner on my index stating "upgrading to non-flash format"... which never happened. I tried converting to HTML5. It couldn't be done. This is what you get today when you visit a Flash website. Simply click and go! THIS DIDN'T EXIST FOR THE LONGEST TIME!!! Because of that, many of us closed our sites. As I mentioned before, our pages were just blank, not even a popup! When modern browsers updated, they omitted the use of this code. But then out of the blue, someone threw a wrench in the gear of the machine and included this new embed format, which Google very much resents... Behold, the new "object class" for Flash! You can shrink this code, but for the sake of sharing it with amateur devs, here it is in all its glory! Because of this, I've witnessed more and more websites re-opening with Flash. People like flash. It's easy to use, it's pretty, and let's not forget the most important aspect.... PRESERVATION! There are many more like it, all unique, beautiful and amazing! There are phone apps that simulate it, but it's not the same. This is history, this is the real deal, how millions of us experienced the web and it should NEVER be forgotten or be allowed to die. I guarantee you, it won't die. This is the revelation. Flash is here to stay. A lot of us are really fed up with HTML5. For what it does, it may be fine, but it's not a true replacement for Flash. You can't easily (or at all) convert over. Swiffy attempted to help people to do this, but Google saw how broken it was, they actually pulled their live services. So in conclusion, I highly advocate the lot of you, who want to learn or use flash, (or closed your flash site), to reopen or open a new and bring on a wave of Flash sites! OK now onto the nitty gritty. The reason they tell you not to use Flash is because they claim it is not secure, drains the batteries, is slow, or just outdated. Who said that??? Wanna know? Google did! These goons actually tried to PAY ME to advocate the use of HTML5 and abandon Flash, to my fellow forumers. This really happened. They hired people to visit various tech forums and pay some of the users advertise not to use Flash anymore. 1- It does not consume batteries faster than HTML5. There were big corp youtube channels demonstrating two similar laptops, one using Flash and another HTML5 for video playback. They claimed that the laptop with Flash died 10 minutes before the one with HTML5. What you don't know is that they most likely put a weaker battery in the Flash laptop. This lead many of us to reproduce the experiment at home. I had two Dell laptops, exact same model, same test... both died at the exact same time ON THE DOT! Same goes for tablets. 2 - Is Flash Slower than HTML5? I tested it on my old Core2 Duo based system, still runs fine. Tried a later CPU like 8700k. No issues obviously, it's newer and faster. Again, same goes for tablets. It even worked on my current Alcatel A30. I advocate the use of an older version of Firefox and the FlashPlayer apk. I don't very much care for Puffin browser or Photo Flash Player Browser, these are filled with Ads and quite broken. NO ONE should have any issue running Flash today. 3 - Security issues. This one is a bit complex because it is both true and not true. Need I remind you all of the Spectre and Meltdown issue that exists for Intel CPUs today? Exploits that are very real, yet there is zero documented cases to DATE that suggest these were ever utilized against anyone. Well, that's kinda like how Flash's own exploits are. They exist, but nobody can use them. I had a friend who used to write exploits in actionscript and sell them even, and he always reassured me that the ones getting ripped off are the people who BUY his exploits. To use these exploits is hit and miss, a 1 in x-billion chance because you're basically taking on the entire world. There are approximately 4+ billion users online at any given time, and x-amount of these users will ever encounter your exploit (we all hate ads and never click them), and for those that DO click them, they are 90% not likely to have any sensitive info available... it's not just a bear trap, you have to do some extensive interacting with these exploits to ever be affected by them. The exploits that get your credit card info etc REQUIRE you to punch in the numbers manually. It's not going to go snooping in your hard drive and reading text files or breaking your secure encryption when you buy things on official websites. Do you see how out of proportion they have blown this? Here's what you don't know, but was later revealed. Google and Adobe both sat down and wrote exploit after exploit and released them into the wilds and cried that the sky was falling. Adobe even said that there were SO many exploits, they couldn't keep up with weekly patches. They claimed there were thousands upon thousands appearing each week and that they had to give up and stop supporting flashplayer. HTML5 is NSA technology, and just as HTML5 was released, the NSA fiasco was all over the news. Technology monitoring, listening and spying on you. What a fantastic trade off!!!! Giving up flashplayer which is supposed to be full of exploits, and instead we inherit a web language that is DESIGNED to allow 3rd party to spy on you! Go onto Google and type: HTML5 spying or HTML5 spy exploits and see what the results bring in. Almost every PC (Windows, Linux, Mac, FreeBSD etc etc...) are exposed to these "non-patchable" exploits. With Flash, at least you had a team devoted to patching, but after selling their souls, they wrote the exploits as a campaign to kill off their own product so that Government or others could track and monitor you!